Excel is an excellent program to use if you need to calculate de costs of different alternatives. Excel formulas make it easy to see how figures change when new options are selected, and with the Excel charts you can visualize the figures and compare them more easily. I am showing this in a new demo about Excel calculations in the kalmstrom.com Tips section. 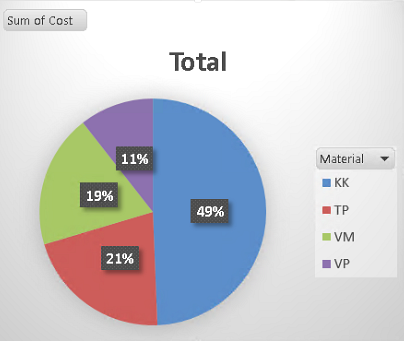 In my example I calculate costs for different floor materials in an imaginary house renovation. The house has thirteen rooms of different sizes, and there are five floor materials of different costs to choose among. In my Excel table I can see how costs varies depending on floor material, for the room as well as for the whole building. Finally I create a pivot chart where I can see more clearly how any changes I make in the tables affect the proportions of the flooring costs for the different materials.